In the first video by Volker Springel, you see the collision and merging of two galaxies. The simulation follows dark matter, gas, and a stellar component, but only the baryonic component is visualized. The next image by Volker Springel shows structure formation in the gaseous component of the Universe, in a simulation box 100 Mpc/h on a side. From left to right: redshift z=6, z=2, and z=0. z=0 corresponds to NOW. Formed stellar material is shown in yellow. Here is a new Hubble photo of the interacting pair Arp 87. Compare with the simulation video! Caption: Two galaxies perform an intricate dance in this new Hubble Space Telescope image. The galaxies, containing a vast number of stars, swing past each other in a graceful performance choreographed by gravity. The pair, known collectively as Arp 87, is one of hundreds of interacting and merging galaxies known in our nearby universe. Arp 87 is in the constellation Leo, the Lion, approximately 300 million light-years away from Earth. These observations were taken in February 2007 with the Wide Field Planetary Camera 2. 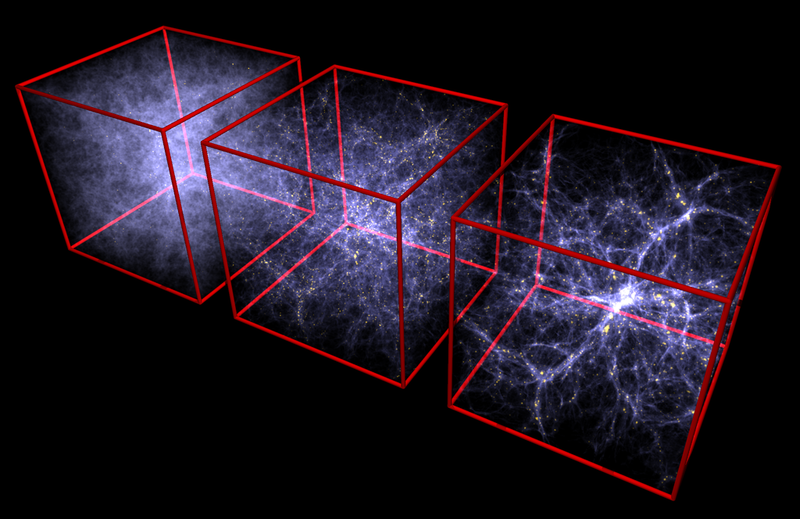 Finally, an animation of the dark matter substructure in a cluster at redshift z=0. Last edited by t00fri on Wed, 31-10-07, 10:14 GMT, edited 1 time in total. Have a look to this great Arp 87 image above (taken very recently by Hubble) and compare with the theoretical simulation by Volker Springel/MPI Garching. The shot is amazing and the simulation seems pretty right! Will we see this kind of events in your Cosmo project? All I can say at this point is that these amazing events belongs to the area of cosmological visualizations with cosmological time scales at work. How and whether this can be implemented is hard to say at this point.